Timber Windows in Kent and Across the UK | Timber Windows Or Pvc? SO WHAT SHOULD I CHOOSE… TIMBER WINDOWS OR PVC? This post discusses the dilemma that many homeowners face when looking to update their home or start a self-build project. Weighing up the pros and cons is not alway easy either but we hope this post will help. People in the UK like timber windows and doors, yet many have switched to PVC. Why? Well, according to many salesmen, PVC doesn’t rot like wood, it’s cheaper and of course, it doesn’t need painting. Sounds great but before you rush off to place your order, read further. Wood by nature is a natural barrier to the cold. When cleverly designed and engineered into a window or door, and combined with double or triple glazing, it far outperforms PVC windows and doors. So why are PVC windows are so popular in the UK? The story is complex, but for many the experience of rotten timber windows relates to those installed in houses after the Second World War. Have you ever noticed how many houses built over a century ago still have their original windows? This is because they were made using well seasoned, high-quality timber. By stark contrast, many buildings built during the post-war period were constructed using inferior materials. Consequently, timber gained itself a bad reputation. Over the last 10 years in particular, the evolution of timber windows in terms of quality, durability and design has been dramatic. Factory finished and treated against rot, with frames which are fully protected from water and UV light; modern high-performance timber windows can have finish guarantees for up to 10 years, and rot free guarantees for up to 30. Dual sealing and factory glazing helps to maximise the life of a unit, and sophisticated design details further lengthen the life of the timber. Comparing this to PVC units, The National Building Federation’s Standards in Quality and Development gives PVC windows a lifespan expectancy of 20 to 25 years; whereas it gives vacuum treated softwood windows 25 to 35 years. According to the Green Builders Digest, ‘Well-designed and well-maintained timber windows can and do last the lifetime of the building in which they are installed’. Maintenance is the challenge for many people, but no material is maintenance-free, despite claims by PVC salesmen. Developments in timber window design and finish have created products that minimise water retention, damp penetration, and with micro-porous paints that allow wood to breathe; all contribute to a low maintenance product. Peeling and blistering paint is a thing of the past. Factory-finished windows need not be repainted for up to 10 years. Thereafter, a 5 to 10-year painting cycle is the norm. Modern finishes also minimise the preparation times. Unlike PVC, your factory finished timber windows and doors can be made to an exact shade of colour to suit your project and property. So, while it remains true that timber windows need some maintenance, modern high-performance windows make that maintenance exceptionally easy. While the initial cost of timber windows can be higher than that of other materials, the ‘whole-life’ cost which timber delivers in terms of maintenance, durability and environmental impact, makes it excellent value for money. To substantiate the value for money, The National Housing Federation finds softwood cheaper, both in terms of initial capital costs and life cycle costs over a period of 30 years. Figures from reports ‘Standards in Quality and Development’, put the cost of buying, fitting and maintaining a softwood window frame at between £149 and £199 over 30 years. In contrast, a PVC frame will cost between £257 and £275. A further cost advantage to wooden windows is the ability to repair and restore them. According to TRADA, the Timber Research and Development Association, wood can be readily repaired, refreshed and maintained without special components, skills or equipment. Finally, timber is, of course, a natural insulator. The glazing solution also plays a major role in the efficiency of your windows and glazed doors – which is why we offer a range of options to suit your requirements. With insulation glass and draught sealing, there is no difficulty in providing windows which meet current requirements of a U-value of as low as 0.6W/m2K. Choosing windows and doors for your home is a big decision and we know you have to be happy with much more than just the product. It has to look right and perform well but most importantly the decision has to feel right. Nobody can influence this, it’s just a gut feeling. We hope our energy efficient windows and doors will give you that feeling and we are happy to help you at every stage of your journey. 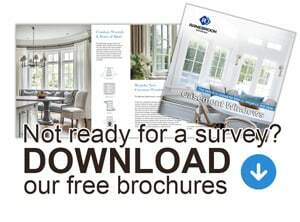 From measuring up and pricing to selecting the finishing touches and installing – the Ranebrook Windows team are on hand to offer as much, or as little assistance as you need. Call our team of experts on 01322 332237 or send us an email with your requirements.